Those of you that travel a lot have probably encountered the situation where you think you set the hotel alarm clock correctly only to learn the volume was turned way down or you had it set to PM instead of AM. Many hotel alarm clocks are becoming more gadgety, including some that double as an iPod docking station to wake you up with your iPod tunes. Well, futzing with an alarm clock you're not familiar with could result in you missing your important meeting. So what do you do? Well, you could call the front desk and ask for a wake-up call. Some hotel systems are even automated so you simply touch-tone the time you want to wake-up. But what fun is that? if you're an Asterisk fan and want to have some fun, you can configure your own wake up reminders. Today, Nerd Vittles wrote an article explaining how you can do just that. You can configure telephony reminders two different ways. One is to dial into the Asterisk system and after entering in your PIN you speak the date & time you want along with your calendar reminder message and the system will record the reminder into the calendar. This is all done using speech recognition technology. The other method is via the web interface. As seen below you can type a message in and using text-to-speech (TTS) it will speak this text over the phone to you at the specified date & time. Today’s edition of Telephone Reminders for Asterisk 1.4 not only lets you schedule reminders by phone using your own voice, but now you can use a clever (if we do say so) web interface as well. 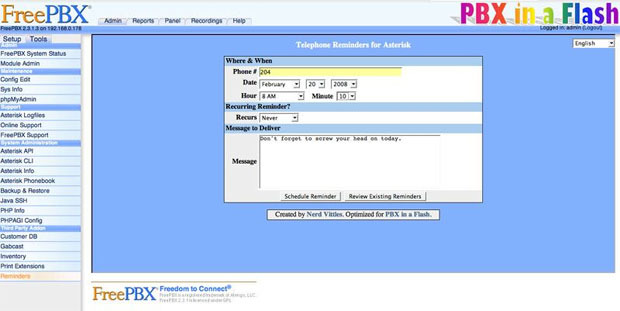 Just fill out a simple web form to set your reminder or recurring reminder in motion, and Telephone Reminders for Asterisk will swing into action with Flite or Cepstral’s Allison to deliver your typed message to the phone of your choice at the appointed time. It’s the perfect tool for bugging the hell out of your friends without ever picking up the phone. Wanna wake your worst enemy in the middle of the night with a nice reading of the Gettysburg Address? No problem. Actually, there is a slight problem. It’s against the law to make irritating phone calls. But it’ll be great for calling all those politicians back to thank them for the hundreds of telephone messages they delivered while you were eating dinner. Nerd explains that this works on PBX in a Flash, but the good news is that it also works on trixbox 2.x - albeit with a caveat - you can't use flite, but Cepstral an alternative TTS engine works. Now the next time you attend ITEXPO, an Asterisk users conference, or some other Asterisk related event you can brag to your colleagues that you got your wake-up call via Asterisk. \nWell, futzing with an alarm clock you're not familiar with could result in you missing your important meeting. So what do you do? Well, you could call the front desk and ask for a wake-up call. Some hotel systems are even automated so you simply touch-tone the time you want to wake-up. But what fun is that? \nif you're an Asterisk fan and want to have some fun, you can configure your own wake up reminders. Today, Nerd Vittles wrote an article explaining how you can do just that. You can configure telephony reminders two different ways. One is to dial into the Asterisk system and after entering in your PIN you speak the date & time you want along with your calendar reminder message and the system will record the reminder into the calendar. This is all done using speech recognition technology. The other method is via the web interface. As seen below you can type a message in and using text-to-speech (TTS) it will speak this text over the phone to you at the specified date & time. \nNerd explains that this works on PBX in a Flash, but the good news is that it also works on trixbox 2.x - albeit with a caveat - you can't use flite, but Cepstral an alternative TTS engine works. \nNow the next time you attend ITEXPO, an Asterisk users conference, or some other Asterisk related event you can brag to your colleagues that you got your wake-up call via Asterisk.